Rolli Cradles are designed efficiently to assist in the pipeline travel operations as well as to facilitate smooth, swift & efficient lowering operations. 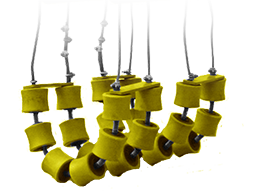 Each unit of rolli cradle is produced with shear perfection & is quality tested before sending it to the customer. 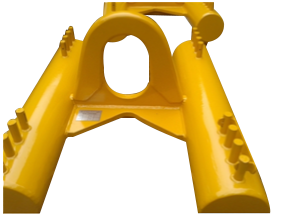 Various cradle assemblies from pipe sizes 6″ (168 mm) to 60″ (1524 mm) are available. 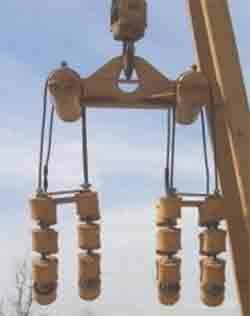 Cradle designed to facilitate easy & quick disassembly for transferring at the sites & for storage. 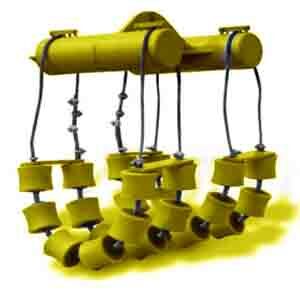 Design facilitates to keep the pipe near to the ground allowing better operational control andÂ mobility. Multiple rollers spaced to support the pipe evenly and to prevent an “egging” problem. Rollers material eliminates pipe coating damage & absorbs heat generated through friction. Dust protection given to the rollers to prevent dust from entering the bearings. Heavy duty high strength bearings are used for rollers to bear heavy loads of pipes.